Look ravishing with the intricate design of the Audrina Wool Blend Cape with Silver Fox Fur Collar in Blue for women. A curly wool blend shell is composed of soft craftsmanship including mohair and virgin wool. 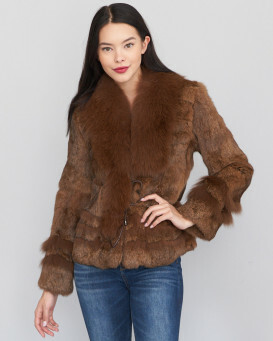 A detachable silver Fox Fur collar creates a versatile look. The back has a center bottom peplum skirt for a sophisticated addition. An asymmetrical front metal YKK zipper closure creates a unique cape coat style. This deluxe cape can be swung around your shoulders and attached or let hanging look for a bewitching appeal. Our comfortable cape is suitable for plus sizes so women of all shapes rejoice!